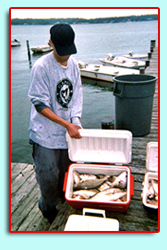 Bunky's Charter Boats offers 18 Rental Boats available to fish, crab, or cruise the Patuxent River . They are all 16 feet in length and equipped with well-maintained Johnson Outboards. We offer 2 different capacity boats. Fifteen of our boats hold 4 adults and three of them hold 6 adults. We've also recently added a 19 foot Carolina Skiff and a Yamaha WaveRunner to our Rental Fleet! We supply gas, life jackets, bait-cutting boards, anchor and anchor-line. Don't forget to bring your sunglasses, lunch, licenses and something to take home your catch. Boat rentals are available on first-come, first-serve basis, 7 days a week from 6am to 6pm during the fishing season. Mid-size Boat w/Electric Start! – $60.00 cash deposit required. 6 People Max. 19' Carolina Skiff– $250.00 deposit required. $106.00 per hour. Includes gas and tax. ALL BOATS MUST BE DOCKED BY 6:00PM. 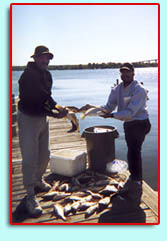 All prices include life jackets, bait boards, anchor and line. Cash deposit required. Must be 21 years of age to rent and operate boats. Children must be 5 years of age and 51 pounds to board boats. Don't forget your fishing/crabbing licenses.